These Cranberry White Chocolate Chip Oatmeal Cookies are soft, chewy, and has the wonderful flavor of cranberries. It’s the perfect cookie for Holidays! This recipe creates a very soft and chewy cookie. 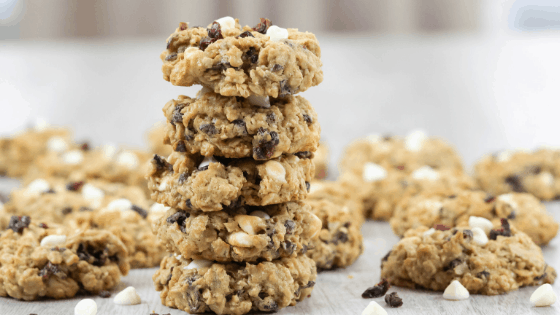 The trick to making these cookies chewy is to only use old-fashioned oats. If you use quick oats your cookies will come out flat and not chewy at all. If you want these cookies to be picture perfect to give as gifts or to serve to guests, chill your dough for about 25 minutes before baking. The cookie temperature will go down and it will prevent the cookies from spreading in the oven. To get my cookies all the same size, I use my cookie scoop to drop the cookies on my silicone mats. I use silicone mats on my cookie sheets because they’re perfect to get an even bake on your cookies. It also makes clean up a breeze! If you find that your cookie is too rounded once they are done, simply press the tops of the cookies with the back of a spoon to slightly flatten them. TIP: Top the cookies off with additional white chocolate chips and cranberry bits to make them extra pretty. Add in salt and baking soda. Stir. Gently stir in old fashioned oats. Once the mixture is combined, stir in white chocolate chips and dried cranberries. Cover bowl and refrigerate for about 25 minutes. Using a cookie scoop, drop by scoopfuls on a cookie sheet and cook for about 14 minutes. Let cookies cool completely so they don't crumble. Wow I’ve gotta try these, yum. I have a similar recipe. Love the combination of white chocolate and cranberries. Great on the holiday treat tray. Perfect for dunking in a latte. The combination of white chocolate and cranberries in a cookie is fantastic! So tasty and sweet! OH man! These look like the perfect twist on a classic cookie! White chocolate chips are some of my fave and cranberries are always a hit!! White chocolate and cranberry is one of my favorite combinations! Sweet and tart, these cookies are perfect for treat giving season. Yum! I love cranberry white chocolate oatmeal cookies! I make a similar one too, so I know this flavour combo tastes amazing! Perfect for the holidays. these look delicious! they’d make a gorgeous christmas gift all wrapped up! I have family in town visiting and we always make cookies for the holiday season. Since we have been baking all week, I thought we’d get started on our Christmas menu then bake more cookies for our New Year’s Eve party. These cookies sound delicious and will make a wonderful addition to our holiday season. My parents absolutely LOVE cranberry and chocolate chip cookies so I bet they’d adore these! I’ll definitely have to try making them the next time they’re over. I love love love white chocolate and cranberry together, and especially for oatmeal cookies. I love a good hearty cookie! These cookies look so tasty! I love how you also added the white chocolate chips—that flavor will pop and the color with the red is so festive! I can’t wait to try these!